Jasper Weekly Courier, August 29, 1913. Chronicling America. 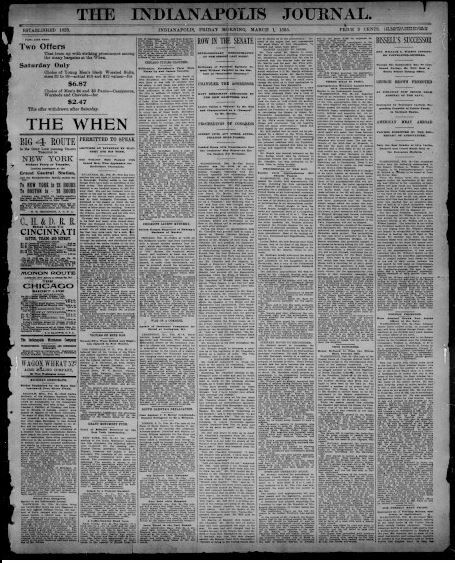 There are currently over 63,000 pages of historic Indiana newspapers available for free through the Chronicling of America website at the Library of Congress. You can find many great pieces of the past there. For instance, if you wanted to find out what happened 100 years ago today, you could check out the Jasper Weekly Courier for August 29, 1913. The Courier ran a column titled “Happenings in Indiana,” click on the image to the right, and go to the sixth column. You can also peruse the entire issue of the paper at this link Jasper Weekly Courier. The following is a news release from the Library of Congress about new grant awards for the upcoming two years, including more Indiana newspapers! 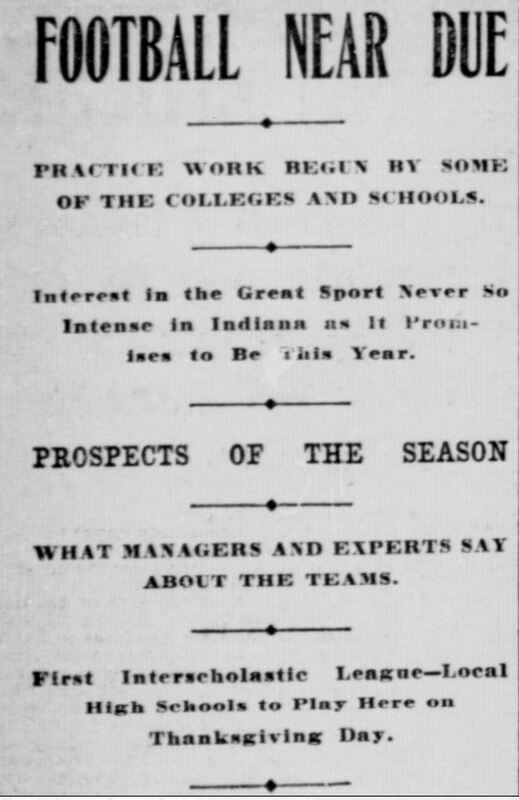 Historic newspapers slated to be added in the coming two years include more issues of the Indianapolis Journal and the Indiana Tribüne, that we were unable to incorporate during the first grant. In addition, the Western Sun, published in Vincennes, Indiana, will be included in the project. The Sun has a long history in Indiana; it has been in continuous publication, despite turnovers in ownership and name changes, since it was started on July 4, 1807. Recently the National Endowment for the Humanities (NEH) announced 14 awards totaling $3.5 million to institutions representing their states or territories in the National Digital Newspaper Program (NDNP). Three projects – sponsored by the Connecticut State Library; the Idaho State Historical Society; and the Mississippi Department of Archives and History – are new to the program this year. The University of Florida returns to NDNP, partnered with a new NDNP participant, the University of Puerto Rico, Rio Piedras, to digitize newspapers from both locations. Ten other institutions – University of Illinois, Urbana-Champaign; Indiana State Library; Kansas State Historical Society; Louisiana State University Libraries; Montana Historical Society; State Historical Society of North Dakota; Oklahoma Historical Society; University of Oregon Libraries; University of South Carolina; and West Virginia University Research Corporation – have received continuing awards to contribute additional content to the program. This funding will support the selection and digitization of historic American newspapers published between 1836 and 1922 by each participating state, according to NDNP technical guidelines. The Library of Congress (LC) will make these newspapers freely available through the Chronicling America Website (http://chroniclingamerica.loc.gov/) beginning in mid-2014. In all, 37 states and territories have participated in the program. NDNP, a partnership between the NEH and the LC, is a long-term effort to provide an Internet-based, searchable database of all U.S. newspapers with descriptive information and select digitization of historic pages. Supported by NEH, this rich digital resource will be developed and permanently maintained at the Library of Congress. The NEH grant program will fund the contribution of content from, eventually, all U.S. states and territories…. Read more about it!